A while after their 2011 debut, the original members of Hands Of Orlac relocated from Italy to Sweden. Now, ??? (voices, flutes), ??? & ??? (guitars), ??? (bass) and ??? (drums) are back with Figli del Crepuscolo (Children Of The Nightfall), a stunning piece of gothic doom metal. At least, that's what the biography claimed. We'll see for ourselves if that's true, since I've been writing this paragraph during the intro - which is already pretty promising, like Kraftwerk on some weird drugs. And indeed, as soon as the first song on this album starts, I'm not sure whether this is doom metal at all. This is gothic rock, something between Moonspell, Inkubus Sukkubus and Faith And The Muse. The focus lies not so much on heavy riffs but on composing and songwriting. This makes Figli Del Crepuscolo an excellent example of modern-day progressive gothic rock, or pagan metal if you like. 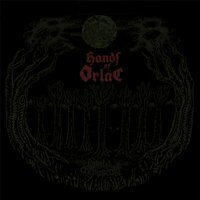 Yet, Hands Of Orlac doesn't sound as clean and friendly as most of the gothic metal bands these days. There's still this gritty, unwieldy atmosphere, very dark indeed. The result is actually a very interesting and refreshing album, filled with danceable rock songs with a doomy atmosphere. Perfect for those awesome basement parties where the dresscode clearly is 'black'. On the other hand, the progressive aspect of this album makes it different from many bands in this genre. In stead of writing the same song again and again (that was another Inkubus Sukkubus reference), Hands Of Orlac constantly switches tempos, incorporates breakdowns, guitar solos, flutes and an array of arrangements. The result is indeed quite stunning and varied. As modern and progressive as this albums sounds, there is still this weird feeling that only pagan metalheads can create. It resembles the darkest days of the seventies and early eighties more than it resembles today's stoner-loaded doom scene. For me, that's the most striking and interesting aspect on this album and it makes a song like 'Noctua' stand out. So the audience for this kind of music probably looks more like hippies in black than like bearded stoners in hoodies, but that's perfectly fine.